One PC is on the local network (and it's connected to the router's local port), the other is on the outer one (connected to the WAN port). A tested device is placed between them. Then the traffic generators start up, and measurements are taken. This is how the router's performance is measured. 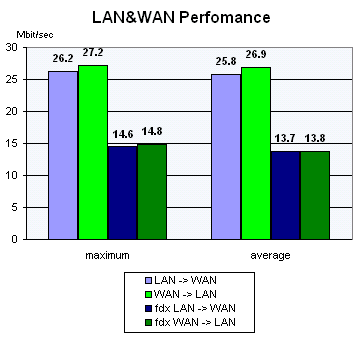 A switch integrated into the device is not tested as its speed is higher than the routing rate. Iperf v1.7 is used for traffic generation ad measurements. Each test (30 sec long) runs 20 times, with the best and average results written down afterwards. The other utility is netPIPE v3.5. It generates traffic with gradually increasing data packets (a packet of the size N is transferred several times, the number of transfers is inversely proportional to its size but not less than 7). Packets get transferred forth and back in series (not simultaneously). This scheme shows to what degree the channel is used depending on the size of data transferred. The program generates a one-way TCP traffic that is why all three possible situations are modeled. On the figure above you can see test results of one of the routers. The maximum score is on the left, and the average value (based on 20 values obtained) is on the right. The program generates a traffic by the Ping Pong method. That is why the data rate remains the same irrespective of on which side the netPIPE client is and where the server is. Beside the diagram you can see the maximum fixed data rate. For this test we use the latest version of the freeware network security scanner Nessus (at the moment it is v1.2.7). An external WAN port is scanned with all available plugins from the list. In the end we get a brief report (without the list of configuration of the current scanning) and a full report generated by Nessus. But even if Nessus finds no vulnerability (or the degree of risk is very low) it doesn't mean everything is OK, because it can appear at any moment. But we can be sure that the programmers paid due attention to this aspect of operation of the device.